Located in the Waterfront South neighborhood amongst commercial, industrial and residential row homes, the Waterfront South Rain Gardens front a main artery into the City of Camden. This four-tenths acre property served as a gasoline service station from the mid-20th Century through the late 1980’s. Having been vacated for well over a decade, the Camden County Municipal Utilities Authority (CCMUA) partnered with the Camden Redevelopment Agency, the NJDEP, CamdenSMART and neighborhood residents to transform this site from an abandoned gas station to a neighborhood rain garden gateway. The Camden Redevelopment Protection Agency provided over $99,764 in funding from an Environmental Protection Agency American Recovery and Reinvestment Act Brownfields Assessment Grant for the investigation of this site. The CCMUA provided over $200,000 for additional environmental activities and the demolition of the former service station. The removal of contaminated soil and underground storage tanks at this site was funded by a $122,000 grant from the NJDEP. The re development of the site into a series of rain gardens was conducted under a new green infrastructure program throughout Camden called the Camden Stormwater Management and Resource Training (SMART) initiative. This initiative includes the City of Camden CCMUA, NJDEP, Rutgers University, the New Jersey Tree Foundation, and Cooper’s Ferry Partnership. The site is now home to four rain gardens, including: the tree and shrub rain garden; the wet meadow rain garden; the butterfly habitat rain garden; and the native grass rain garden. The redevelopment into the rain gardens was funded by CCMUA for approximately $250,000. Rain Gardens are a relatively new form of green infrastructure that reduces the amount of stormwater that enters an overburdened sewer system. The rain gardens help to reduce flooding, reduce combined sewer backups and overflows, improve air water and climate quality, add open space and beautify neighborhoods. 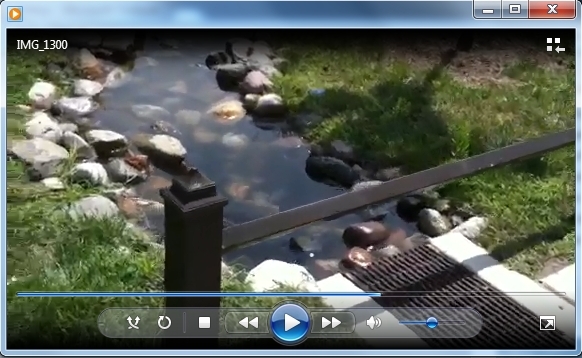 In this short video, Jeremiah Bergstrom of Rutgers Cooperative Extension Water Resources Program shows one of the Waterfront South Rain Gardens in action. The Camden SMART team members worked hand-in-hand with the Heart of Camden, a community-based organization dedicated to revitalizing the Waterfront South neighborhood. The Heart of Camden was pivotal to providing outreach to and engaging the local residents about the project. In 2014, CCMUA with its partners received the inaugural American Planning Association Sustainable Green Infrastructure Project Award for the Waterfront South Rain Gardens Sustainable Green Infrastructure Project. For more information and technical details on the project, visit the Rutgers Cooperative Extension Water Resources Program page on the Waterfront South Rain Gardens. Click here for a summary poster of the project presented at the Brownfields 2013 conference in Atlanta.